Belgian Gymnastics: 2017 European Championships: all you need to know! 2017 European Championships: all you need to know! In a few days, 8 Belgian gymnasts will compete at the 2017 European Championships in Cluj-Napoca (Romania). Here is all you need to know about the team and schedule! On the Men's side, the team is composed of Jimmy Verbaeys, Maxime Gentges, Daan Kenis, Kristof Schroé, Dennis Goossens and Jonathan Vrolix. Verbaeys, Gentges and Kenis will compete in the all-around in qualifications and will try to make the top 24. 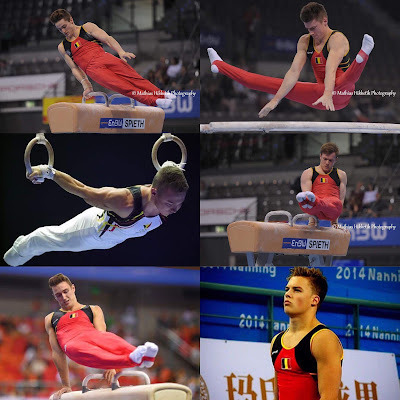 Dennis Goossens will compete on rings, where is has a great shot at making the final. Jonathan Vrolix will compete on floor and vault, while Kristof Schroé will compete on horizontal bar. The boys will compete in the 1st and 2nd subdivision in qualifications. We don't know yet who will compete in which subdivision, but the ones competing in the 1st subdivision will start on parallel bars and the ones competing in the second subdivision will start on pommel horse. Keep in mind that this year's Europeans are individual, there won't be a team competition. The competition will be livestreamed by the Eurovision platform here. You can also follow the score thanks to the SmartScoring App or by following the blog on Facebook or Twitter. Review of the competition will also be posted on the blog, along with pictures. On the Women's side, team Belgium will be represented by Nina Derwael and Julie Meyers. Senna Deriks was set to compete but unfortunately injured her knee in training last week. Both Nina and Julie will compete on all four events in qualifications with the hope of reaching individual finals. Nina has a great shot at qualifying for the uneven bars final. The girls will compete either in the 1st or 3rd subdivision. In the 1st subdivision, the gymnast will start on bars. The one competing in the 3rd subidivision will start on floor. As for the boys, the competition is an individual one, no team competition this year.